Developed at the Howard Hughes Medical Institute’s Janelia Research Campus, Thunder is a new library of tools that speeds the analysis of data sets that are so large and complex they would take days or weeks to analyze on a single workstation. For example, Thunder was used by Jeremy Freeman, Misha Ahrens, and other colleagues at Janelia and the University of California, Berkeley, to quickly find patterns in high-resolution images collected from the brains of active zebrafish and mice with multiple imaging techniques. New microscopes are capturing images of the brain faster, with better spatial resolution, and across wider regions of the brain than ever before. Yet all that detail comes encrypted in gigabytes or even terabytes of data. On a single workstation, simple calculations can take hours. “For a lot of these data sets, a single machine is just not going to cut it,” Freeman says. It’s not just the sheer volume of data that exceeds the limits of a single computer, Freeman and Ahrens say, but also its complexity. “When you record information from the brain, you don’t know the best way to get the information that you need out of it. Every data set is different. You have ideas, but whether or not they generate insights is an open question until you actually apply them,” says Ahrens. That’s why trying to analyze neuroscience data with slow computational tools can be so frustrating. “For some analyses, you can load the data, start it running, and then come back the next day,” Freeman says. “But if you need to tweak the analysis and run it again, then you have to wait another night.” For larger data sets, the lag time might be weeks or months. Distributed computing was an obvious solution to accelerate analysis while exploring the full richness of a data set, but many alternatives are available. Freeman chose to build on a new platform called Spark. Developed at the University of California, Berkeley’s AMPLab, Spark is rapidly becoming a favored tool for large-scale computing across industry, Freeman says. Spark’s capabilities for data caching eliminates the bottleneck of loading a complete data set for all but the initial step, making it well-suited for interactive, exploratory analysis, and for complex algorithms requiring repeated operations on the same data. And Spark’s elegant and versatile application programming interfaces (APIs) help simplify development. Thunder uses the Python API, which Freeman hopes will make it particularly easy for others to adopt, given Python’s increasing use in neuroscience and data science. 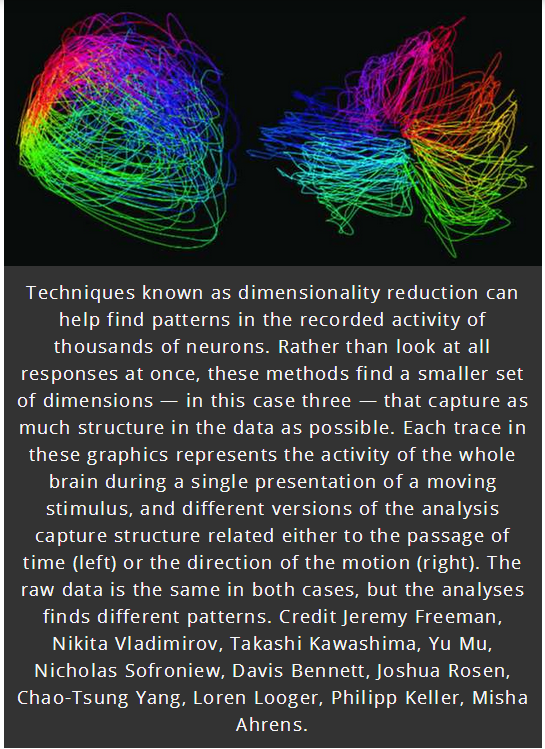 To make Spark suitable for analyzing a broad range of neuroscience data – information about connectivity and activity collected from different organisms and with different techniques – Freeman first developed standardized representations of data that were amenable to distributed computing. He then worked to express typical neuroscience workflows into the computational language of Spark. From there, he says, the biological questions that he and his colleagues were curious about drove development. “We started with our questions about the biology, then came up with the analyses and developed the tools,” he says. Using Thunder, Freeman, Ahrens, and their colleagues analyzed images of the brain in minutes, interacting with and revising analyses without the lengthy delays associated with previous methods. In images taken of a mouse brain with a two-photon microscope, for example, the team found cells in the brain whose activity varied with running speed. For analyzing much larger data sets, tools such as Thunder are not just helpful, they are essential, the scientists say. This is true for the information collected by the new microscope that Ahrens and colleagues developed for monitoring whole-brain activity in response to visual stimuli. Last year, Ahrens and Janelia group leader Phillip Keller used high-speed light-sheet imaging to engineer a microscope that captures neuronal activity cell by cell across nearly the entire brain of a larval zebrafish. That microscope produced stunning images of neurons in the zebrafish brain firing while the fish was inactive. But Ahrens wanted to use the technology to study the brain’s activity in more complex situations. Now, the team has combined their original technology with a virtual-reality swim simulator that Ahrens previously developed to provide fish with visual feedback that simulates movement. In a light sheet microscope, a sheet of laser light scans across a sample, illuminating a thin section at a time. To enable a fish in the microscope to see and respond to its virtual-reality environment, Ahrens’ team needed to protect its eyes. So they programmed the laser to quickly shut off when its light sheet approaches the eye and restart once the area is cleared. Then they introduced a second laser that scans the sample from a different angle to ensure that the region of the brain behind the eyes is imaged. Together, the two lasers image the brain with nearly complete coverage without interfering with the animal’s vision. Combining these two technologies lets Ahrens monitor activity throughout the brain as a fish adjusts its behavior based on the sensory information it receives. The technique generates about a terabyte of data in an hour – presenting a data analysis challenge that helped motivate the development of Thunder. When Freeman and Ahrens applied their new tools to the data, patterns quickly emerged. As examples, they identified cells whose activity was associated with movement in particular directions and cells that fired specifically when the fish was at rest, and were able to characterize the dynamics of those cells’ activities. Example analyses like these, and example data sets, are available here. Ahrens now plans to explore more complex questions using the new technology, and both he and Freeman foresee expansion of Thunder. “At every level, this is really just the beginning,” Freeman says. Image Source: The image is credited to Jeremy Freeman, Nikita Vladimirov, Takashi Kawashima, Yu Mu, Nicholas Sofroniew, Davis Bennett, Joshua Rosen, Chao-Tsung Yang, Loren Looger, Philipp Keller, Misha Ahrens, and is adapted from the HHMI press release.